Oh my word these were good. On the way to our honeymoon, my husband and I had a layover in Jamaica. We decided to have an appetizer at Margaritaville while we waited for our next flight. I ordered coconut shrimp. They were so good! I don't usually like coconut, but for some reason I ordered this. I am glad I did. I have literally thought about those shrimp since that day, and a week later when we ordered them again while waiting for our connecting flight home. Finally, I attempted to make them for my family. This recipe was a hit. So delicious! It takes a bit of time, but it's worth it. The sauce is also really good. I went back and forth between the one below and sweet chili sauce. Both are good. Give it a try! In medium bowl, combine egg, 1/2 cup flour, beer, and baking powder. In two separate bowls place 1/4 cup flour and coconut. 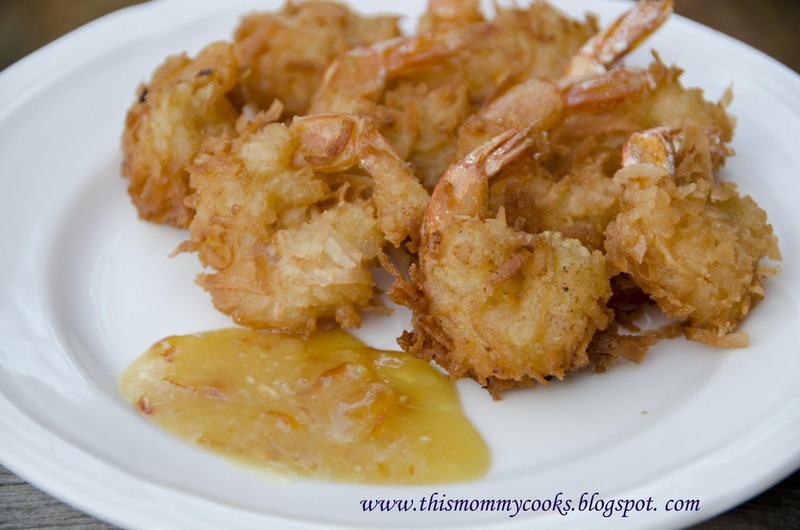 Hold shrimp by tail, and dredge in flour, shaking off excess flour, then dip the shrimop in the egg/beer batter; allow excess to drip off. Last, roll shrimp in coconut, and place on a baking sheet lined with wax paper. Place in freezer for 15 minutes, or refrigerate for 30 minutes. Meanwhile, heat oil to 350 degrees F (175 degrees C) in a deep-fryer or deep pan/pot. Fry shrimp in batches: cook, turning once, for 2 to 3 minutes, or until golden brown. Using tongs, remove shrimp to paper towels to drain. Serve warm with dipping sauce. Combine orange marmalade, mustard, and horseradish sauce together and serve.